Hermona Soreq is the Charlotte Slesinger Professor of Molecular Medicine at the Edmond and Lily Safra for Brain Sciences, which she helped found. 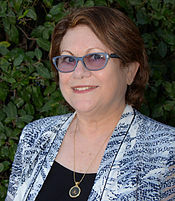 She earned her Ph.D. at the Weizmann Institute of Science and joined the Hebrew University faculty in 1986. Professor Soreq is a former Dean of the Faculty of Science and currently serves on the university’s Executive Committee. Her groundbreaking research focuses on the signaling of acetylcholine and its relevance in stress responses and neurogenerative diseases like Alzheimer’s and Parkinson’s. Professor Soreq heads the International Organization of Cholinergic Mechanisms and has a DNA-based drug in phase II clinical trials. She has received three Honorary Ph.D.s from leading institutions, and her work appears in close to 300 scientific journals. Among her many honors are: a Teva Founders’ Award; The Lise Meitner Alexander von Humboldt Foundation Award; the Rappaport Prize for Biomedical Research; and the Landau Prize for Biomedical Research.